Charlie Bears Foxtrot Discounts Apply ! Hi I am Foxtrot I am created from the finest Schulte mohair and alpaca. Foxtrot blends beautifully from white Alpaca through grey and then finally tipped to a dramatic black mohair. 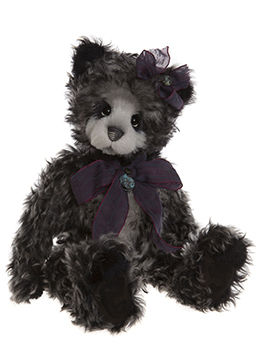 She has sculptured paw pads, deep set glass eyes and a new styled overstitched nose detail. Her accessories include a ribbon fascinator and hand tied ribbon bow strung together by a button and pendant detail. .